In the past several years, drug screening has become increasingly complex. There are more and more options for donors who attempt to cheat a drug test. And, the passing of medical and recreational marijuana laws impacts half the States to date. It’s more important now than ever for employers to have a clear understanding of common terms related to drug tests. 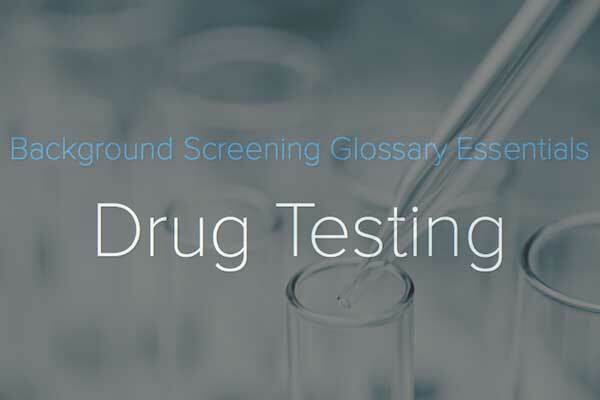 This summary (from the full Background Screening Glossary) will help you interpret and use drug screening results! Adulterated Specimen – A drug/alcohol screening specimen that has been deliberately tampered with. Adulterant – A Substance ingested or added to urine in order to prevent detection of drugs/alcohol. Chain-of-Custody Form (COC) – Used for drug/alcohol screening to identify and track a specimen from the point of collection through release of the test results. Common COC forms include a unique number sequence (Specimen ID), bar code, and a carbon copy of all pages. Collection Site – The location where an individual submits a specimen for drug/alcohol testing or Titers blood testing. Dilute Specimen – A specimen containing abnormally low creatine levels compared to normal human urine. Donor – The individual submitting a specimen for drug, alcohol and/or Titers blood test. Invalid Specimen – During SVT (Specimen Validity Testing), a specimen that contains an unidentified adulterant, interfering substance, or abnormal characteristics that prevents completion of a valid drug/alcohol test. Lab – Location in which full clinical testing takes place for drugs, alcohol and Titers. Medical Review Officer (MRO) – A licensed physician responsible for evaluating medical explanations before issuing a final positive drug test result, such as reaching out to confirm a valid prescription and dosage level. Panel – A list of drugs that are tested for in a body fluid or hair specimen provide by a donor. Point of Collection Test (POCT) – On site, instant or rapid drug and alcohol test when the specimen is immediately tested for drugs/alcohol at the same location in which it was collected, such as at the work site. Specimen – A sample of body fluid or hair provided by an individual for the purpose of drug, alcohol or Titers testing. Specimen ID – Unique number sequence assigned to a specimen at the collection site for a drug, alcohol or Titers test. The Specimen ID is essential for quality control, namely tracking movement of the specimen. Specimen Validity Testing (SVT) – Used during a drug and alcohol test to detect substitution (not human urine), adulteration (abnormal urine or detection of a substance added after collection) or dilution (excessive water content). Titers Blood Test – The act of testing one’s blood for the presence of antibodies, most often used in the healthcare setting to mitigate the spread of communicable disease. The challenges faced by employers to maintain a drug-free workplace in this rapidly changing legal landscape is unprecedented. Although you’ll need an attorney to help you write a policy that is enforceable and in accordance with the law, you’ll also want a professional background screening company to help with the logistics of enforcing your policy. Pre-employment drug and alcohol testing, Titers testing, Post-Accident and reasonable suspicion – all the reasons you drug test, Choice works with you to make it easier to manage. Let us know what questions you have about drug testing!